Heading back to the Vineyard in the morning…here is the photo I took from the boat when I left there just before Thanksgiving that, for some reason, I couldn’t upload at the time. I am looking forward to seeing the harbor one more time…although it was fun to be back at the 99 Restaurant tonight, Wednesday night. There is nothing like a great waitress to make you feel at home. Thanks, Denise! So I had this bright idea this morning. I am heading off-island for Thanksgiving visits, and thought it would be cool to take an early morning shot of the harbor. It always looks so neat just before dawn, with tiny lights of fishing boats gliding across the water and day workers deboarding the ferry from the Cape with their lunch bags and tool boxes. I didn’t expect the fog would have rolled in during the night. What you see is, unfortunately, what you get. Or rather, what I get, for trying to fool Mother Nature. 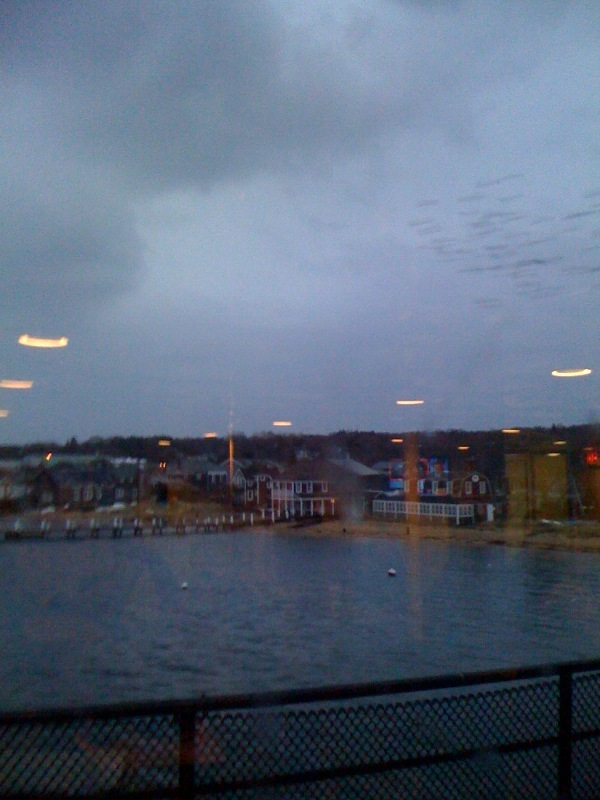 Anyway, once I was on (it’s a smaller boat, Nantucket, this morning – thankfully, I was early so I didn’t have to tuck my car between cement walls, a fate that often happens to little cars like mine), daylight (not the sun) was peeking through, so I took a picture of Vineyard Haven harbor from the top deck, and also a quick one inside the lounge so you could see what life is like between here and there, the Vineyard and the mainland. Unfortunately, my browser isn’t uploading more than one pic today. Perhaps it’s due to the free WiFi on the ferry. Argh! Sorry. Happy Thanksgiving to all – I’ll return to blogging Friday, Dec. 2nd. And if you’re headed out of town, drive, fly, or ride safely! 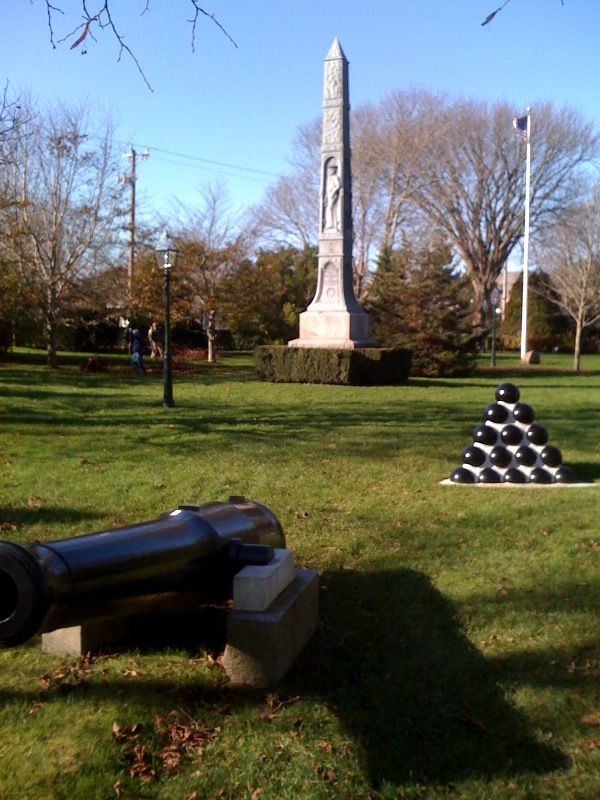 To enter the historic village of Edgartown, you will pass by Cannonball Park. I’m not sure if that’s the official name, but folks call it that. If you look at the pics, I’m sure you’ll see why. It’s a lovely little park. There is flagpole and an obelisk memorial to World War II veterans. There are a couple of cannons. And, then, there are the cannon balls. 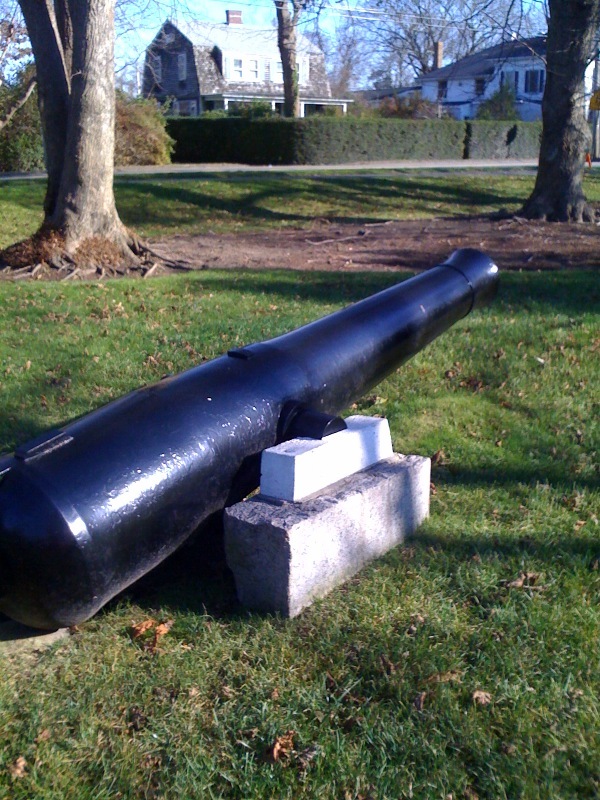 I’ve decided that the cannon (and the balls) are the graphic reminder of earlier times, perhaps when Edgartonians needed to fight off those nasty British (alas, some of my ancestors) who were rapidly sinking their whaling ships. But if you look closely, you might see what bothers me. 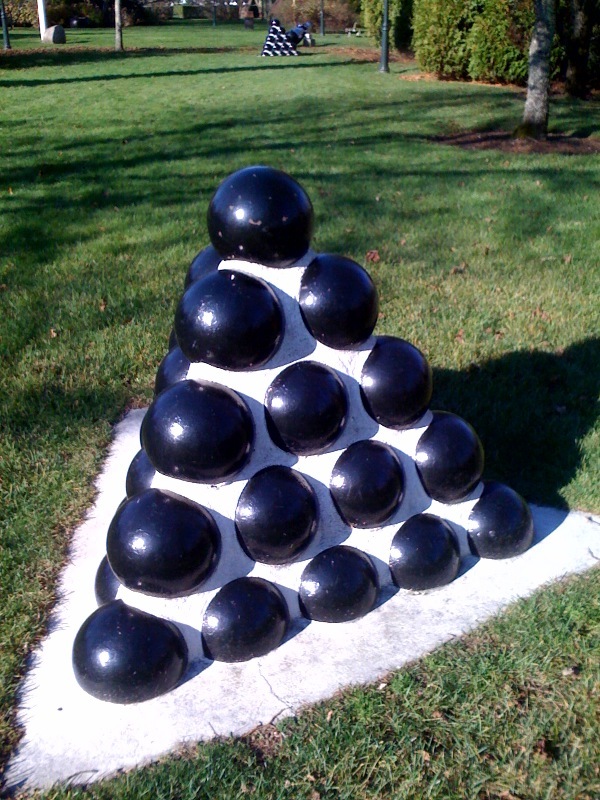 The cannon balls are pyramided together, creating a shape that seems more concrete than balls. Hmm. All of which, I find concerning. Well, anyway, that’s something I’ve been pondering. Yes, I know. I have way too much time on my hands. 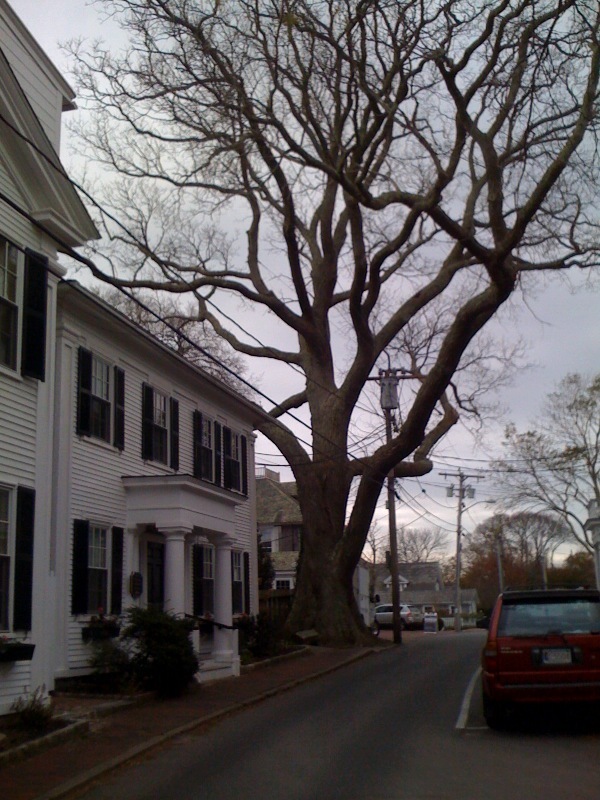 A Tree Grows…and Grows…on South Water St.
It’s kind of a gray day, but I wanted to share this pic of the pagoda tree on South Water St. Okay, so it’s a tree. But it’s no ordinary one. 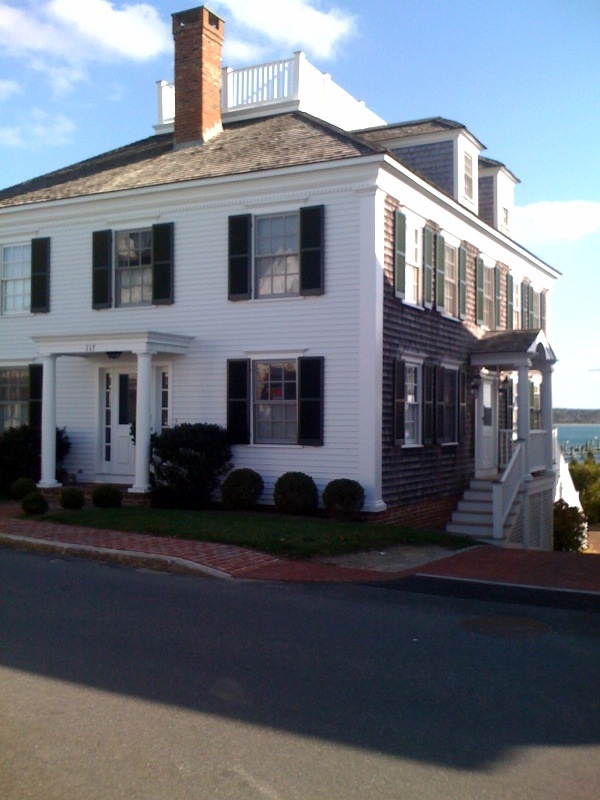 It’s actually been here since 1837, when it was brought from China to Edgartown in a flower pot. I did the math: that’s almost 175 years ago. Imagine all the things this tree has witnessed – and survived: Hurricanes! Snowstorms! Tourists! It’s believed to be the oldest of its species alive and well in North America today. And, yes, it’s been trimmed more than a few times, and, from what I’m told, propped up here and there. In springtime, its buds are a sure sign of on-going, healthy growth; in summer its shade is welcome. In autumn it is beautiful; and in winter it stands tall and, well, not exactly straight, but at 175, I suppose few things do. Anyway, in these days of here-today, gone-tomorrow, sometimes I think it’s cool to check out things that are just, well, solid. No, this is not where I am staying. But it is an amazing house…right on North Water Street in Edgartown – yes, that’s the harbor peeking on the side of the backyard. It reminds me of Jill’s house (PLACES BY THE SEA, OFF SEASON), which, of course, I made up. Now for the good news: this one has a sign in the window reads: For Rent. So if you’re looking for a great “cottage” for that summer vacation, look no further. This is the real deal. It was an interesting day. I was headed to Chappaquiddick for the Book Club meeting, which was to be complete with wonderful cider, pound cake, apple kuchen, and jellies and jams (2 of the women are cleaning out their refrigerators, getting ready to leave the island for the winter). In the mornings, however, there’s always a good line due to construction workers and the smaller On Time ferry that I’ve mentioned before. I was right: there was a line, but not too long. I expected to reach the (other) island early, which would be great. I could spend some time exploring! I took my place behind a dump truck that had a small bulldozer on a trailer that was hitched to the back. We waited. Every few minutes we moved up a little. I kept checking my watch. Plenty of time. 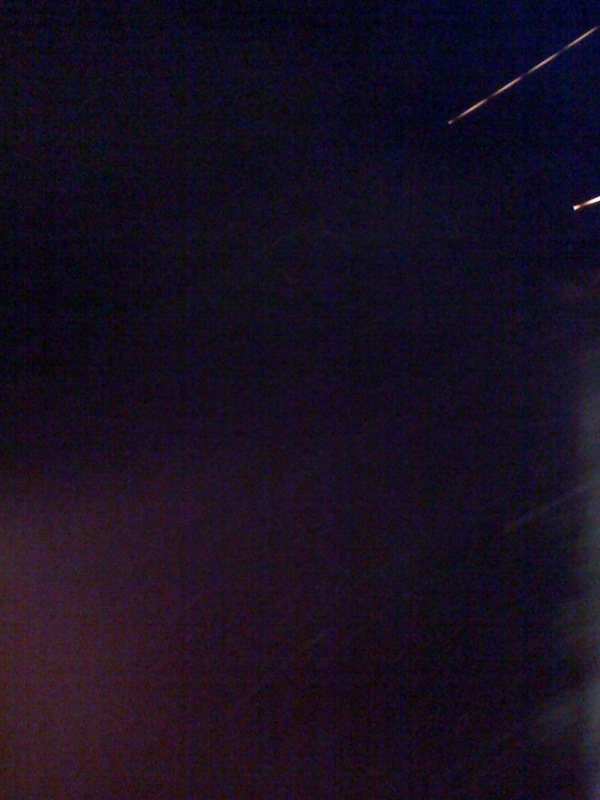 Until…until it nearly was my turn. And someone decided that the truck in front of me had to remove the bulldozer. Apparently the small ferry couldn’t hold both the dump truck and the bulldozer simultaneously. A flurry of activity ensued. One of the workers started up the dozer, backed it off the ramp. There seemed to be some confusion about what to do with it. Several minutes later it was decided the dozer would cross to Chappy without its truck or trailer. The dump truck crossed sans dozer. We were next! The earthmover and me! For some reason, though, it took an extra long time for the unloading and reloading process on the other side. 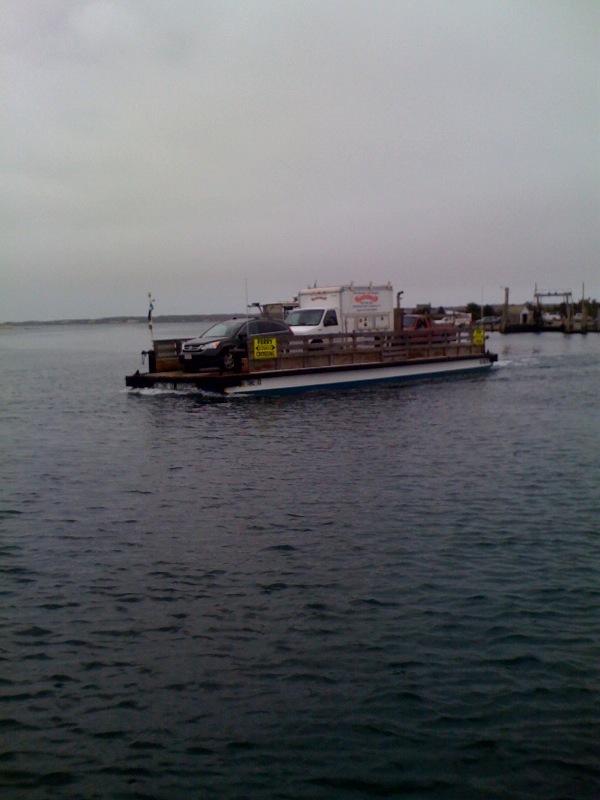 Finally, the ferry began its trek back toward Edgartown and us. Then everything went really weird. The On Time headed south (which is not unusual to compensate for the strong current). Then it spun around. Not kidding it spun around. I gulped. I began to reconsider my commitment to the Book Club. Before I could change my mind, the dozer was ambling toward the ferry and I was being waved on. Yikes. Long story short, I made it. I did however, unclip my seatbelt and rolled down my windows. If they were going to spin this thing I was going to be ready for a swim. I did not need to worry. Turns out the spinning was because one of the trucks that boarded on the “other side” had needed to back off for a technical reason. I have no idea what the further explanation was. Anyway, there was no spinning on my trip. I was, however, late for the Book Club meeting. So I was off-island yesterday, and I simply had to stop in Woods Hole before getting back on the ferry and take a picture of this sign. It is my very favorite one in this whole, entire, lovely world. 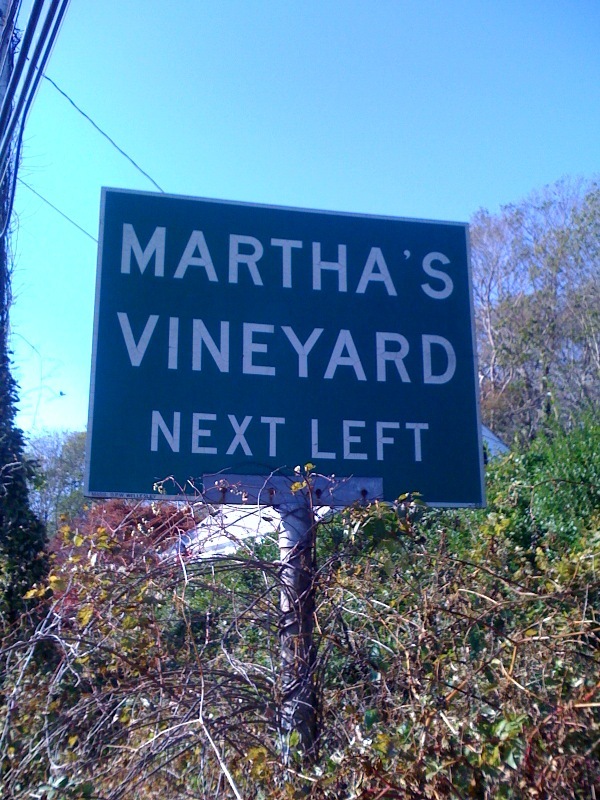 In truth, if you take your “next left” and keep going, you’d better have on your water wings, because you’ll run smack into Vineyard Sound. Since I first noticed that sign years and years ago, it has amused me. Not because I’m a literary snob (hardly), but because I’d like to think that someone in the State Highway Department has a very cool sense of humor. Have a great day – it’s another gorgeous one out here on the island!